As suggested by reader Pallais, today I'd like to cover the (currently, for less than another week) level 50 flashpoint Kaon Under Siege. It fits in well at this point in the series, as it represents yet another "type" of flashpoint that's different from the ones I already talked about: Kaon is a flashpoint that's available to both factions but still puts a relatively heavy emphasis on story. 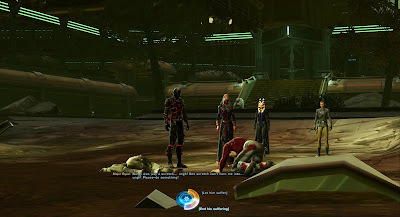 Kaon Under Siege was the first flashpoint added to the game after launch, in patch 1.1, which was appropriately named "Rise of the Rakghouls". 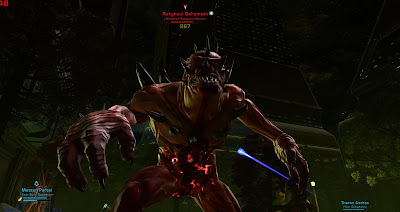 In the galaxy as we knew it at launch, rakghouls were a problem that was strictly limited to Taris, and people had no reason to assume that rakghouls were any more likely to start showing up on other planets than, say, the killiks of Alderaan. (If anything it was less likely, since we know from Vector's companion story that killiks are space-faring at least.) 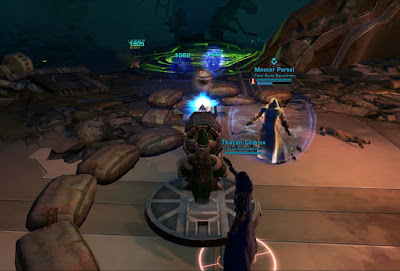 Kaon Under Siege laid the foundation for the rakghoul plague to become a galaxy-wide threat, a storyline on which Bioware based its first one-time world event and which would eventually result in the repeating Rakghoul Resurgence that we now know so well. 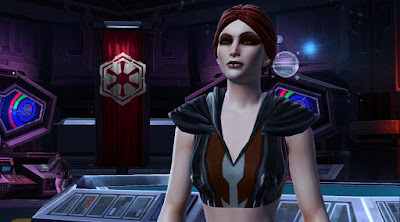 Both Republic and Empire players receive a breadcrumb quest on their respective fleet (called "Outbreak in the Tion Hegemony" and "Trouble in the Tion Hegemony" respectively), which leads them to a representative of their faction who gives them a briefing on the situation: Chief Rannos for the Republic and Darth Nurin for the Empire. The Tion Hegemony is introduced as a relatively powerful faction that has remained neutral in the conflict between the Republic and the Empire so far, and both sides are eager to make use of any opportunity to sway it to their side. Such an opportunity seems to have arisen now: Several planets in the Hegemony have been infected with the rakghoul plague, which is causing considerable panic. You are supposed to travel to the planet Kaon, where some survivors - members of the ruling family among them - have openly asked for help. Darth Nurin, your chest piece looks so weird. 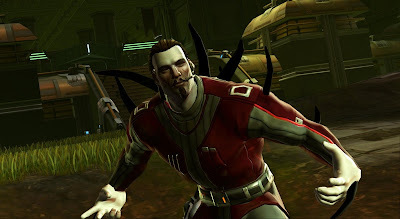 When it comes to interesting trash mobs, Kaon Under Siege probably takes the number one spot among SWTOR's flashpoints to this day (assuming you do it at the appropriate level; anything can be overpowered after all). 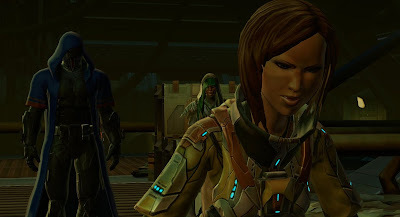 You start off by killing a few hostile nobles, but soon run into people who have already been infected by the rakghoul virus, and eventually you meet full-fledged rakghouls and even rakghoul supersoldiers (intelligent rakghouls that wear armour and carry weapons). 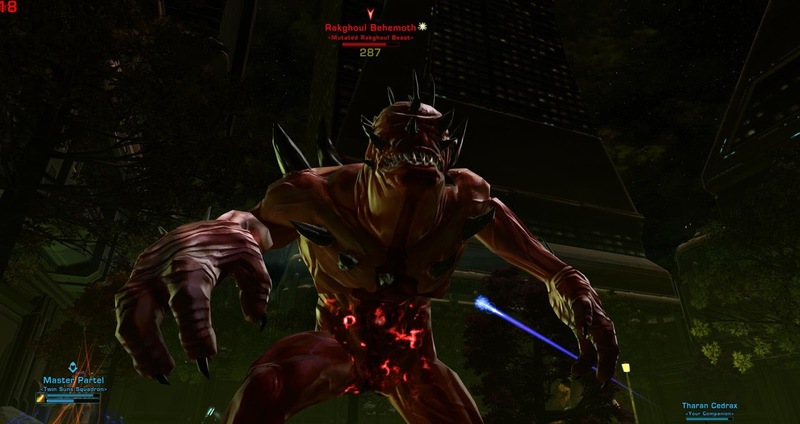 The enemies that have been turned but haven't yet turned into generic rakghouls are actually the most dangerous, as there's a selection of "infected so-and-sos" that all have different, highly disruptive abilities. Most (in)famous are probably the infected mercenaries, who will pull someone in with a tow cable and channel a stun on them for a reeeally long time, while slowly doing damage to the player in the process. 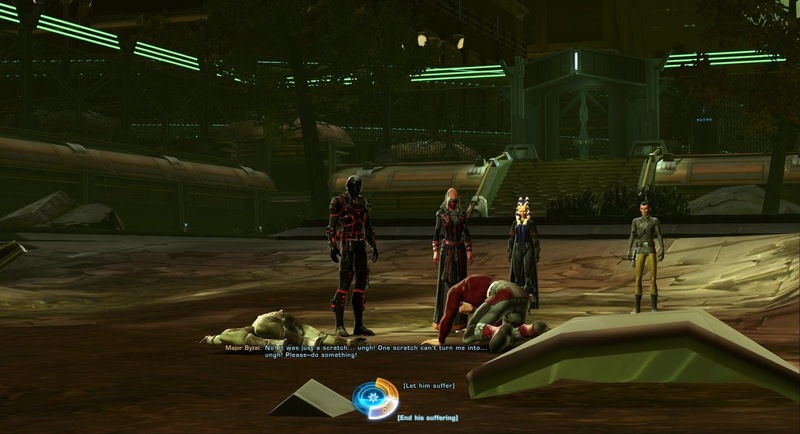 During Kaon's heyday I suffered many a wipe because of these mercenaries, because if the tank or healer got trapped and wasn't freed in time, the rest of the group would quickly find itself in big trouble. A typical day on Kaon. In addition there are infected screamers, which have a massive knockback and can send you flying into the next mob group, as well as bloated plaguebearers who explode on death, doing considerable damage in the process and also flinging people backwards if they are caught in the blast. There is one room towards the end of the flashpoint in particular where three or four groups of mobs are packed very close together, so if people don't put their backs to the wall, someone inevitably gets thrown into another pack, which can then easily lead to a wipe. We used to call it "the room of death". It's telling that in this Dulfy guide from 2012 this room is listed almost as if it was another boss! Next up is the Rakghoul Behemoth, a giant mutated rakghoul that likes to knock people about and has to be defeated by making use of the environment. Mainly he has a damage absorption shield that has to be removed every so often by pulling him towards an explosive barrel and blowing it up, however this mechanic has been a bit buggy for a while from my experience, meaning that the shield can stay on even after the Behemoth has started burning, so you only do piddly damage throughout the entire encounter and inevitably run into the enrage. Let's hope that this problem has been fixed before this fight makes a comeback as current content in KotFE. There is also a turret you can activate, and if you pull the boss past it, it will shoot him whenever he's in range. I've always considered this a pretty interesting fight. The last boss, a trio of rakghoul supersoldiers, is not too difficult to handle. Once again kill order is a concern, though you can approach it multiple ways. Things to consider are that two of the three rakghouls can't be taunted while their commander is alive, while the biggest of the lot likes to pounce on people and will continue to savage them unless you inflict sufficient damage to him to interrupt this process. Also, the first two kills will spawn a wave of small adds each, which can be killed quite easily if your dps remembers to use AoE, however they can be a pain if they manage to swarm your healer. 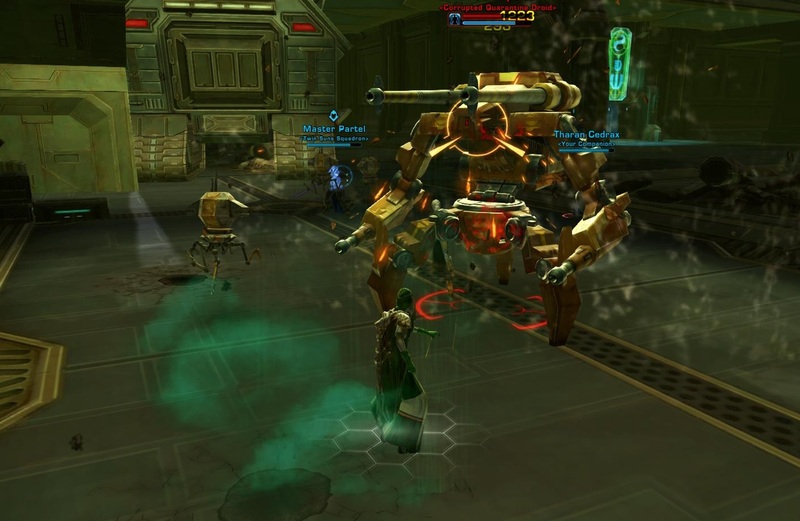 The instance's bonus boss, a droid, was extremely hard on launch, harder even than anything else in the instance, which was why many people used to skip him (especially since he also didn't really drop anything particularly worthwhile). The tricky bit was that at 66 and 33% health each, he would shield himself and summon three probe droid adds that did considerable AoE damage - too much to have the tank round them all up, but also too much to have anyone else tank them individually, so if you wanted to successfully beat the encounter you had to be able to co-ordinate crowd control perfectly the moment the probes spawned and/or be able to do some very good kiting. Finally, it's worth mentioning that there's also a second bonus boss that only appears whenever the Rakghoul Resurgence event is live and that has a guaranteed chance to drop a Midnight Rakling. You land at night and almost as soon as you exit your ship, you are contacted by your local contact, Major Byzal. He reports that some desperate nobles are trying to illegally break the quarantine and have hijacked a shuttle. It crashes almost immediately, and you meet with Major Byzal and his team at the crash site to check for survivors. You find some, but they are already infected! Major Byzal's entire team gets killed in the attack, except for the major himself. He is not happy with the situation and complains to Republic players that they've taken way too long to offer their assistance. 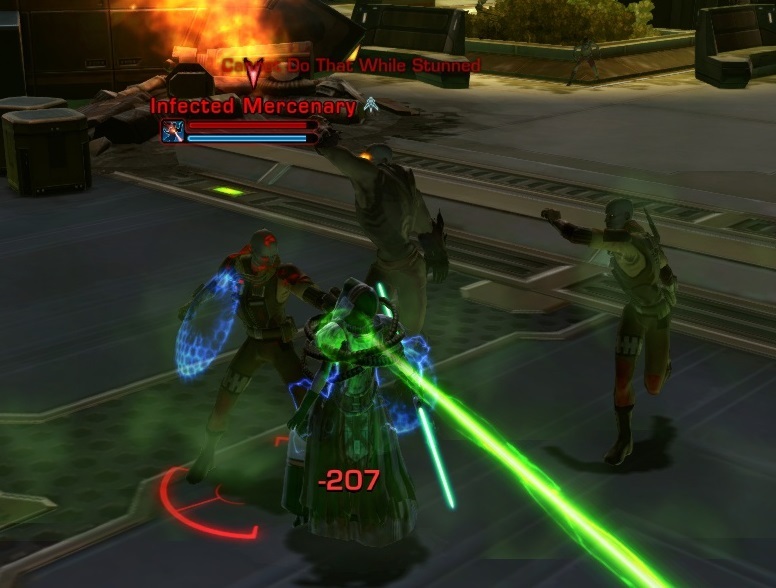 Imperials even get accused of being directly responsible for the outbreak of the plague. After he mentions that it all started at the spaceport, he suddenly starts showing symptoms of infection himself. You have the option to kill him instantly or to wait out his inevitable transformation and kill him afterwards. Interestingly, whether you gain light or dark side points for your choice depends on your faction here. 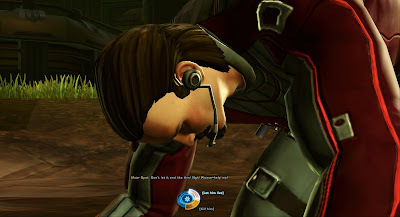 For Republic players, letting him live is the light side option and killing him is dark side, while for Imperials it's framed as a light side mercy killing vs. the dark side option of watching him suffer through his transformation. Comparison of the crucial moment for Republic (top) and Empire (bottom). You fight your way through the city, which feels like dealing with the aftermath of a zombie apocalypse, as you make your way through eerily abandoned locations like an empty cinema where something is still being screened. Many areas are very dark and you have to pick up little floating lamps to be able to see anything at all. Rakghouls randomly burst out of the ground or drop from the ceiling, forcing you to be on your guard at all times. Eventually you make it to the spaceport, where you encounter increasingly intelligent and even armed rakghouls. 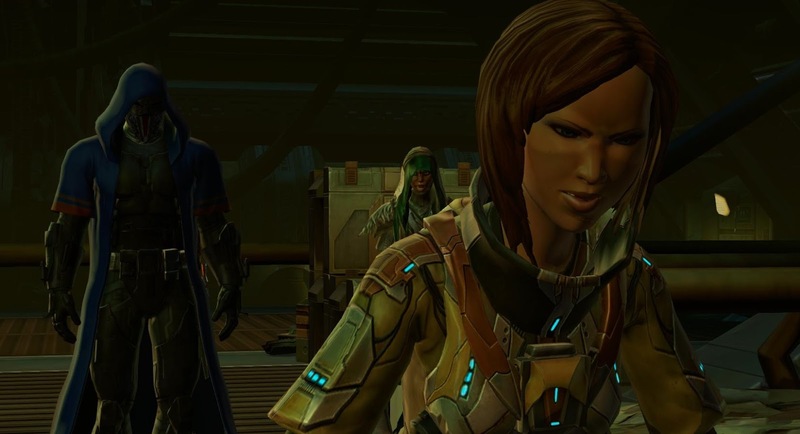 Once you kill the last boss, a pilot comes out of hiding and confesses that the rakghouls arrived on her ship, but she swears that she had no idea what was going on. She traces the whole thing back to a Doctor Lorrick who lives on Ord Mantell, an exiled member of the ruling family's main rival house. This serves as the lead-in for the second flashpoint in this story arc, Lost Island. You have the option of killing the pilot for her involvement in getting Kaon infected with the plague. Kaon Under Siege is a beautiful example of Bioware's flashpoint team at their best. 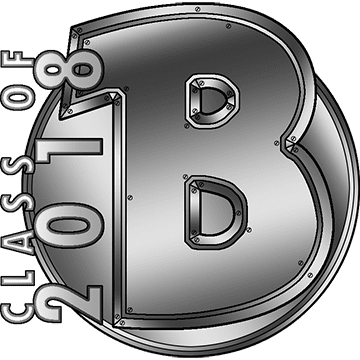 Unlike some of the earlier flashpoints, Kaon manages to strike a healthy balance between telling a compelling story and retaining replayability. There a couple of cut scenes that are key to advancing the story, but they are not overwhelming. The extremely disruptive trash mobs also make for challenging and interesting gameplay at level. The whole setup is also extremely atmospheric, and at least at release, the concept of a zombie apocalypse in the Star Wars universe still felt relatively novel. (Knowing the sheer size of the expanded universe, it probably happened somewhere else before, but it certainly felt unusual to me at the time to see "zombies" in a Star Wars setting.) Admittedly the novely has worn off somewhat since the Rakghoul Resurgence has become a recurring event, but it's still fun to see where it all started. You know, I've never run through Kaon Under Siege; it was one of those that never seemed to come up in the random queue. I may have to give it a try sometime soon. Also, the hard modes were legitimately hard at level 50 -- which I enjoyed. Sometimes it is nice to push yourself, especially in a pug, and succeed. That's when finishing has the biggest sense of satisfaction. Sadly it's rare that story and fun gameplay are combined in such a perfect package. But you're right, one can hope! One of my favourites too. Dark and creepy zombie survival flashpoint. And a Midnight Rakling as your prize if you time it right! Love my Midnight Rakling. Only Rakling I need now is the one from the Eyeless (Damn you loot rolls! Why you hate me so much?). Assets-wise, I'm fairly sure Kaon is just Corellia at night, though.